For other types of trawlers, see Trawler. Fishing intensity extracted from Automatic Identification System data of EU trawlers greater than 15 metres in length, in the period October 2014 – September 2015 (see Main Map for full resolution). During the 17th century, the British developed the Dogger, an early type of sailing trawler commonly operated in the North Sea. The Dogger takes its name from the Dutch word dogger, meaning a fishing vessel which tows a trawl. Doggers were slow but sturdy, capable of fishing in the rough conditions of the North Sea. The modern fishing trawler was developed in the 19th century, at the English fishing port of Brixham. By the early 19th century, the fishermen at Brixham needed to expand their fishing area further than ever before due to the ongoing depletion of stocks that was occurring in the overfished waters of South Devon. The Brixham trawler that evolved there was of a sleek build and had a tall gaff rig, which gave the vessel sufficient speed to make long distance trips out to the fishing grounds in the ocean. They were also sufficiently robust to be able to tow large trawls in deep water. The great trawling fleet that built up at Brixham, earned the village the title of 'Mother of Deep-Sea Fisheries'. This revolutionary design made large scale trawling in the ocean possible for the first time, resulting in a massive migration of fishermen from the ports in the South of England, to villages further north, such as Scarborough, Hull, Grimsby, Harwich and Yarmouth, that were points of access to the large fishing grounds in the Atlantic Ocean. The small village of Grimsby grew to become the 'largest fishing port in the world' by the mid 19th century. With the tremendous expansion in the fishing industry, the Grimsby Dock Company was opened in 1854 as the first modern fishing port. The facilities incorporated many innovations of the time – the dock gates and cranes were operated by hydraulic power, and the 300-foot (91 m) Grimsby Dock Tower was built to provide a head of water with sufficient pressure by William Armstrong. The earliest steam powered fishing boats first appeared in the 1870s and used the trawl system of fishing as well as lines and drift nets. These were large boats, usually 80–90 feet (24–27 m) in length with a beam of around 20 feet (6.1 m). They weighed 40–50 tons and travelled at 9–11 knots (17–20 km/h; 10–13 mph). The earliest purpose built fishing vessels were designed and made by David Allan in Leith in March 1875, when he converted a drifter to steam power. In 1877, he built the first screw propelled steam trawler in the world. This vessel was Pioneer LH854. She was of wooden construction with two masts and carried a gaff rigged main and mizen using booms, and a single foresail. Allan argued that his motivation for steam power was to increase the safety of fishermen. However local fishermen saw power trawling as a threat. Allan built a total of ten boats at Leith between 1877 and 1881. Twenty-one boats were completed at Granton, his last vessel being Degrave in 1886. Most of these were sold to foreign owners in France, Belgium, Spain and the West Indies. The first steam boats were made of wood, but steel hulls were soon introduced and were divided into watertight compartments. They were well designed for the crew with a large building that contained the wheelhouse and the deckhouse. The boats built in the 20th century only had a mizzen sail, which was used to help steady the boat when its nets were out. The main function of the mast was now as a crane for lifting the catch ashore. It also had a steam capstan on the foredeck near the mast for hauling nets. These boats had a crew of twelve made up of a skipper, driver, fireman (to look after the boiler) and nine deck hands. Steam fishing boats had many advantages. They were usually about 20 ft longer (6.1 m) than the sailing vessels so they could carry more nets and catch more fish. This was important, as the market was growing quickly at the beginning of the 20th century. They could travel faster and further and with greater freedom from weather, wind and tide. Because less time was spent travelling to and from the fishing grounds, more time could be spent fishing. The steam boats also gained the highest prices for their fish, as they could return quickly to harbour with their fresh catch. 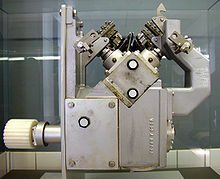 Since World War II, commercial fishing vessels have been increasingly equipped with electronic aids, such as radio navigation aids and fish finders. During the Cold War, some countries fitted fishing trawlers with additional electronic gear so they could be used as spy ships to monitor the activities of other countries. Decca Navigator (Mark 21) and Decca Track Plotter (the forerunners of modern GPS navigation and plotting equipment) on the bridge of this (rather dated) trawler. A net mensurations system using acoustic sensors which measure the depth and opening of the trawl net. catch sensors give information about the rate at which the cod end is filling. symmetry sensors give information about the optimal geometry of the trawls. tension sensors give information about how much tension is in the warps and sweeps. Crew quarters are usually below the wheelhouse and may include bunks, with cot sides to stop the occupant from rolling out in heavy weather. The need for drying sea clothes is shown by a notice in at least one steam trawler's boiler room saying "Do not dry oil frocks over the boiler". Trawlers can be classified by their architecture, the type of fish they catch, the fishing method used, or geographical origin. The classification used below follows the FAO, who classify trawlers by the gear they use. Outrigger trawlers use outriggers, or booms, to tow the trawl. These outriggers are usually fastened to, or at the foot of the mast and extend out over the sides of the vessel during fishing operations. Each side can deploy a twin trawl or a single otter trawl. Outrigger trawlers may have the superstructure forward or aft. Warp winches with capstans are installed on the deck to haul the catch. This small shrimp trawler uses outriggers, with a forward deckhouse and aft working deck. Outrigger trawlers with a forward superstructure and aft working deck are widely used to target shrimp. The towing winch is usually located to the rear of the superstructure so warps from the drums feed to bollards on the cap rail, and then to towing blocks on the outriggers. Outrigger trawlers with aft superstructure and midship working deck are usually beam trawlers (see below). These use large beams to rig the trawls. Beam trawlers are a type of outrigger trawler (above), with the superstructure aft and the working deck amidships. They use a very strong outrigger boom on each side, each towing a beam trawl, with the warps going through blocks at the end of the boom. This arrangement makes it easier to stow and handle the large beams. The outriggers are controlled from a midship A-frame or mast. The towing winch is forward of the superstructure, with the towing warps passed through deck bollards and then out to the towing blocks on the booms. Beam trawling is used in the flatfish fisheries in the North Sea. They are equipped with equipment for hauling the net and stowing it aboard. Typically an echosounder and sonar is used for finding fish. Otter trawlers deploy one or more parallel trawls kept apart horizontally using otter boards. These trawls can be towed in midwater or along the bottom. Otter trawlers range in size from sailing canoes to supertrawlers. Otter trawlers usually have two gallows at the stern with towing blocks. The towing warps run through these, each regulated by its own winch. Medium and large trawlers usually have a stern ramp for hauling the trawl onto the deck. Some trawlers tow twin parallel trawls, using three warps, each warp with its own winch. Some otter trawlers are also outrigger trawlers (above), using outriggers to tow one or two otter trawls from each side. Usually otter trawlers have the superstructure forward, though it can be aft or amidship. Gallows are on the stern quarters or there is a stern gantry for operating the otter boards. Pelagic trawlers can use fish pumps to empty the cod end. 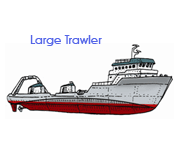 Pair trawlers are trawlers which operate together towing a single trawl. They keep the trawl open horizontally by keeping their distance when towing. Otter boards are not used. Pair trawlers operate both midwater and bottom trawls. The superstructure is forward or midships and the working deck aft. Pelagic trawlers can have fish pumps to empty the codend. RV Celtic Explorer, a bottom trawler used for research. Any fish processing usually occurs in deck houses or below deck. A wet fish stern trawler stores the fish in ice or sea water which has been refrigerated. A freezer stern trawler stores the fish in frozen boxes or blocks, and a factory stern trawler processes the catch. A pelagic stern trawler may use fish pumps to empty the codend. Trawler/purse seiners are designed so the deck equipment, including an appropriate combination winch, can be rearranged and used for both methods. Blocks, purse davits, trawl gallows and rollers need to be arranged so they control the pursing lines and warp leads and in such a way as to reduce the time required to convert from one arrangement to the other. These vessels are usually classified as trawlers, since the power requirement for trawling is higher. During both World Wars some countries created small warships by converting and arming existing trawlers or building new vessels to standard trawler designs. They were typically armed with a small naval gun and sometimes depth charges, and were used for patrolling, escorting other vessels and minesweeping. Occupational safety is a concern on fishing trawlers. For example, a United States cooperative which operates a fleet of 24 bottom trawlers in Alaskan water reported 25 fatalities over the period 2001–2012. The risk of a fatal injury was 41 times higher than the average for workers in the United States. ^ Vespe, Michele; Gibin, Maurizio; Alessandrini, Alfredo; Natale, Fabrizio; Mazzarella, Fabio; Osio, Giacomo C. (30 June 2016). "Mapping EU fishing activities using ship tracking data". Journal of Maps. 0: 1–6. arXiv:1603.03826. doi:10.1080/17445647.2016.1195299. ISSN 1744-5647. ^ "Navigation and Vessel Inspection Circular 5-86: Voluntary Standards for U.S. Uninspected Commercial Fishing Vessels" (PDF). United States Coast Guard. August 1986. Retrieved 2008-08-25. ^ "Survey and Vessel Registration". Maritime Authority of New South Wales. 2008. Archived from the original on 2008-07-21. Retrieved 2008-08-25. ^ "Five-year review of the effects of Amendment 80" North Pacific Fishery Management Council, October 2014, pp.45–53. Wikimedia Commons has media related to Trawlers.